The title of Fuchsia Dunlop’s Chinese cookbook is intriguing. The Revolutionary Chinese Cookbook might not immediately sound appealing. Is this food for revolutionaries? Perhaps dishes to be welcomed by malcontent student activists and probably served from huge vats dotted around government buildings. 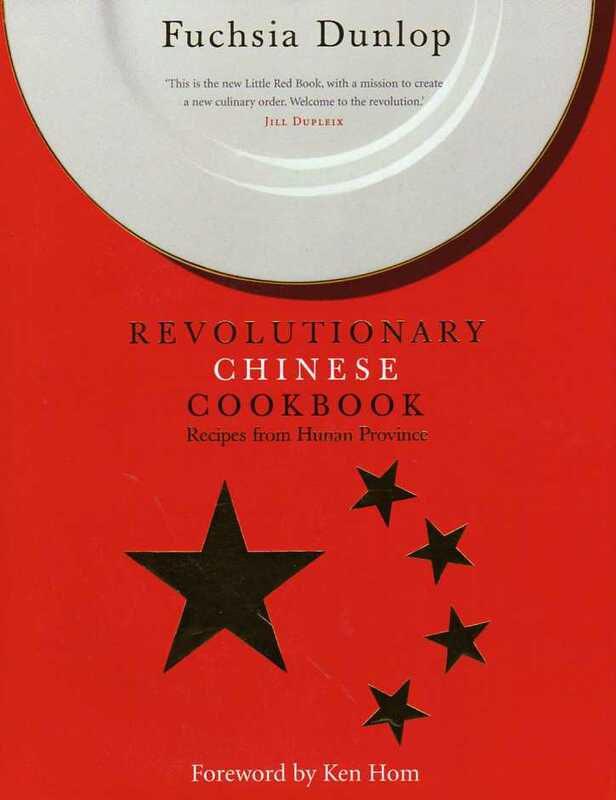 It is in fact a tome that could just as reasonably be entitled the Evolutionary Chinese cookbook as it does indeed chart the history of the culinary heritage of Hunan Province, incidentally the home region of Chairman Mao. Fuchsia Dunlop is European but one suspects that her heart is pure Chinese. She trained as a chef in China at the Sichuan Institute of Higher Cuisine in Chengdu where she lived for several years. She is a fluent Mandarin speaker and is considered one of the UK’s foremost authorities on Chinese food in all its delicious and diverse guises. The foreword is penned by none other than Ken Hom, such is the regard in which this lady is held. Hunan dishes are prized for their chilli-laden robustness but with the addition of steamed delicate delights, and tangy fermented black bean preparations that are truly moreish. This is a cuisine that will turn the head of any of us who have found the regular Cantonese high-street ‘favourites’ to be somewhat lack-lustre and contrived. I for one could envisage myself craving Hunan food in the same way as I would the striking dishes of northern India or Sri Lanka. There are temptations on every page and these have a gratifyingly short list of ingredients, all of which will be available in your supermarket, local Asian grocers or online. A store of half a dozen or so packs or bottles will supply you with the fixin’s for all these recipes. You will likely already have a wok, and the traditional wok scoop, guo chan, will help you to sway like a Chinese chef and even sound like one. No, you won’t be speaking like a native resident of Hunan after a moment of stirring, but the distinctive metallic scrape of gau chan on wok is unique. Spicy Steamed Pork Buns – duo jiao xiao bau – are simple to make and are traditional snacks from a teahouse dating back to 1875. The Duyan survived the worst excesses of the Cultural Revolution, only to be demolished in the early 2000s. Culinary memories still linger and these buns must surely be part of the reason for the success of the original restaurant. The recipe makes 20 dumplings which will disappear in moments. Chairman Mao is said to have loved a particular pork dish and now it bears his name. Mao shi hong shao pou is Red Braised Pork with the ubiquitous chillies as well as aromatic cassia bark and liquorishy star anise. Beef with Cumin – zi ran niu rou – takes advantage of a spice that most of us associate more readily with Indian dishes. This particular recipe comes from Guchengge restaurant in Chengsha. Cumin gives a distinct flavour, turning this into real comfort food. Vegetarians are well catered for. One of the simplest yet most vibrant preparations here is Stir-fried Peppers with Black Beans and Garlic – duo chi chu la jiao. It lacks the typical chillies but relies instead on salty fermented black beans for savour. The Revolutionary Chinese Cookbook is a triumph. It’s a marvellous recipe book without doubt. It introduces the reader to a lesser-known style of Chinese food – glossy sauces with rich and memorable flavours. It is also a culinary travelogue and regional history, a book to cook from and to snuggle down with on long winter nights. I assure you, you’ll want to do both. Outstanding.